We’ve fitted the fabric and bamboo walls into the van. They are held in place with flanged l-track. The van is starting to look more civilized. We had the foam and fabric glued on to the wall panels by the end of November, but had to put everything on hold while I did some “real” (paid) work instead of spending time on the van. Our neighbor Ken helped out by taking several hours to spray the cabinet pieces and bamboo wall panel with a clear acrylic polyurethane finish for us. That meant all the wall panels were ready to go. Just before Christmas, we finally had time to put the panels in place. 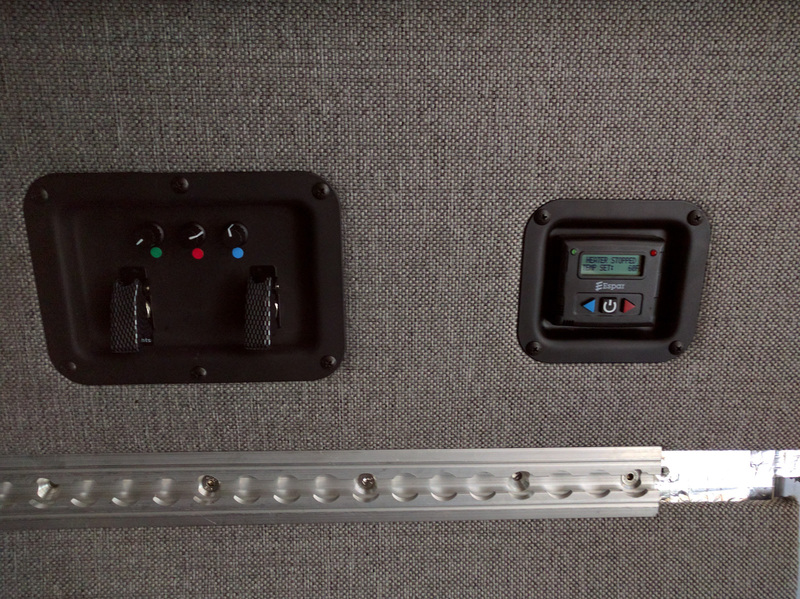 This also means we’ve finally hidden all the wiring, and flush-mounted the switches and control panels. The wall plates we used to recess the outlets are normally used for flight cases. Some of them required some custom holes in order to work for our switches. For instance, the tri-color LED strips have a control box with separate Red, Green and Blue controls. That box is hidden behind the panel, with just the knobs poking through. You have to be careful drilling holes through the panels with the fabric glued on. The drill bit can catch and pull the fabric. It’s best to first melt the fabric and foam with a soldering iron (or just a hot nail) before drilling, or to drill before you add the fabric and foam. The effect on the fabric surfaces is really pleasant – the wall plate flanges compress the foam behind them, so the whole plate sits almost level with the fabric. In some of these pictures you can see how the l-track flanges hold the panels against the wall. The large central panels are currently not following the wall contour, but that will change when the rails that hold the bed panels in place are attached about half way up those panels. where did you get the bamboo walls? We made the bamboo walls from 8×4 sheets of 1/4″ bamboo plywood. Teragren makes it. You’ll need to find a local distributor. Very appealing wall coverings. Curious what glue you used to attach Interweave to Foam/Bamboo? We didn’t use bamboo under the foam – it would have been hideously expensive! We used plain 1/8″ or 1/4″ plywood. The glue was DAP’s Weldwood Landau Top adhesive, which is a contact adhesive. We used it to attach the foam to the plywood, and then to attach the interweave fabric to the foam. It’s been holding really well subsequently. In some places we used 3M 90 spray adhesive instead. It seems to have worked pretty well too, but it ends up being much more expensive because you have to buy it in aerosol cans. There’s a little bit more information about the walls on this page. Where did you get the fabric for the walls? Hi, we got our fabric from Kovi via Amazon. Perfect Fit sell a cheaper version that looks just fine. Get a sample before you buy. Hi, I love your use of L-track to make adjustable attachment points for cabinets and storage. Is there a reason why you couldn’t also use it for hanging the bed?. And I’m assuming you mounted the track with rivnuts (M8?). Did you just fit these into the vertical pillars of the van, one per pillar? Great conversion, you are setting the standard I hope to follow! There’s no real reason you couldn’t use L-track for hanging the bed. The one thing you need to do is work out what L-track attachment you’ll use. In Europe they have some awesome pole things that clip in to the L-track. Those would make great cross-pieces for a bed but they are not available in the USA. If you used E-track instead (more industrial, uglier), there are attachments that take 2×4 wood beams. We wanted our bed at a specific height, and it would have been hard to run L-track at that height without welding on some metal support plates behind it. We ended up using a kit from Overland Sprinters for the bed rails. 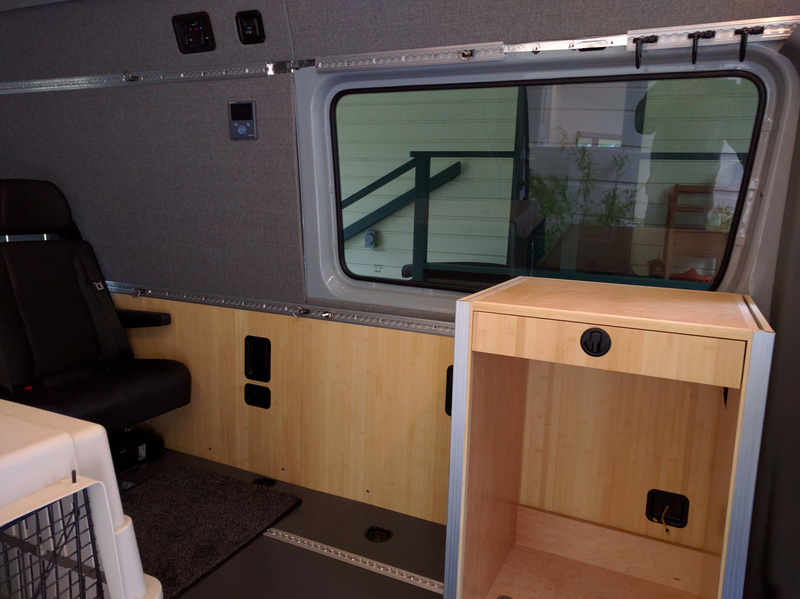 InertiaMan on the Sprinter Forum used vertical L-track and L-track attachment studs to bolt on his bed rails. It gives him 13″ of vertical adjustment. However, he said the hassle of unbolting and rebolting the rails means he seldom does it, and it was hard to make sure the L-track ran perfectly vertical, because the walls are anything but straight. We mounted the L-track with M6 rivnuts and stainless fasteners. You could also use 1/4″-20 nuts and fasteners. We placed the L-track on the bodywork at a height where there is a solid run of metal from front to rear. There are rivnuts every 4″ along that length. The L-track comes pre-drilled with countersunk holes every 4″. It turns out that some of the holes don’t work (if there’s a hole in the van body metal at that point, or a weld, for instance) but we ended up bolting through in most places. It’s a LOT of rivnuts! You could use less bolts, but it depends how secure you want your loads to be. One bolt per pillar would be much too weak. The L-track bars themselves are pretty strong, but they aren’t designed to have long unsupported spans. Hi, thanks for the informative response. Given your final comment, I think I need to wait until I can properly examine the van (which I am yet to buy) before knowing whether this would work for my bed plans. I’m an ex-Brit so commiserations (mainly) on the “for now” part of your statement. Wistra make several L-track system additions (PDF), including a “shoring beam” that slots into wall- or floor-mounted tracks. They even make a version that has L-track mounted on it. Now you can have L-track on your L-track. I’m sure you’d find it easier to get hold of this stuff than we ever would in the USA. Probably a little spendy though. Indeed, it is quite expensive. I’ll note, for other UK readers finding this thread, that Unwin also make a system (designed mostly for holding down seats and wheelchairs in vehicles) that’s available here. They even do a campervan kit, and you can find their stuff on eBay quite easily. That’s annoying. There are some shipping companies that will receive items in a foreign country and then forward them on to you. BorderLinx is one – we’ve not used them, but the idea is interesting. Just to clarify, there are some Wistra products available on Amazon UK. Loadcare is one seller with a decent enough range. The official Wistra store on Amazon.de however has a better range, including the excellent telescopic airbeams, which are potentially excellent for supporting a bed. My own issue is that Unwin rail is the one that’s available to me locally but they say it is incompatible with Wistra and Qstraint products. It’s not really practical to import rail due to the length. I’m not sure I believe it however as some of the accessories used by the local Unwin retailer look identical to the generic and Wistra ones. I’ve used a few reshipping companies before to get deliveres from the UK and US with no issues. I’m sure I’ll find a German Wistra reseller that would be happy to ship the Airbeams here. Congrats again on this site btw, it’s an incredible resource and you have what I would consider the best solutions for very many conversion challenges! Fionn, I think the compatibility issue comes in to play with some of the accessories that span several “holes” in the L-track rails. If some rails are made on one inch centers and others are made on 25mm centers, then over 10 holes you’d be 4mm off. It’s not a lot but it’s probably enough for the precision pieces. The individual and 3-hole-span components would probably fit either system. Yet another change of tack. They’re designed for attaching a square beam or piece of wood at right angles to the track. They’re ideal for something like a bed support which would be fixed length and eliminates any issues with shipping the longer telescopic poles – which are also round (so more difficult for fixing) and 3 times the price at least. Fionn, those attachments look like a great solution. Much cheaper and also potentially more sturdy because you can choose your own cross bar material. The images for this attachment show the clips on the underside. For a bed frame you’d be putting the clips on the ends of the cross bar. Obviously you’ll need to design things so that the cross bar slots in after you’ve clipped the attachments in place because otherwise unlike the telescoping poles there’d be no way to unclip the opposing sides. Thanks for sharing this great find. I’m tempted to get some just to play with! These ones might eliminate any issues with disconnecting and are half the price! They still sell them on eBay but they don’t have them listed on their web store. Those are solid, cast units at a nice price. I was concerned less about how easy it was to remove the unit from the l-track and more about how if you have a fixed width item, you won’t be able to get both ends to seat in the l-track in the walls and/or you won’t be able to remove the bar with both l-track ends installed. Not a massive deal, but worth considering how you’ll make it work. Obviously that’s one reason why the Wistra beams are telescoping. They can be expanded into place to connect with opposing walls. That’s a very valid point, I was thinking of fixing the support permanently to the rail at one end and using something like this to retain it at the other end. The hasp could be mounted on the underside of the beam with the clip on the support. Wonderful! Let us know how the beams turn out as bed supports. I was wondering how many panels you used for your ceiling and how it was mounted? I see you used some single L track mounts. Are those mounts used on the seams only? Are there any other fasteners? How do you like it? Thank you! I love the look of the recessed electrical components. Where did you locate the hardware to recess? The electrical components are recessed in Penn Elcom recessed dishes. They are normally used for flight cases that carry bands’ equipment from gig to gig. Here’s a post that talks about them in some detail. We also wrote about them a bit here for the heater thermostat, here for the fridge ventilation, and here when we added rear speakers with a separate amp. The dishes come in zinc finish or black paint. They come in several different sizes. 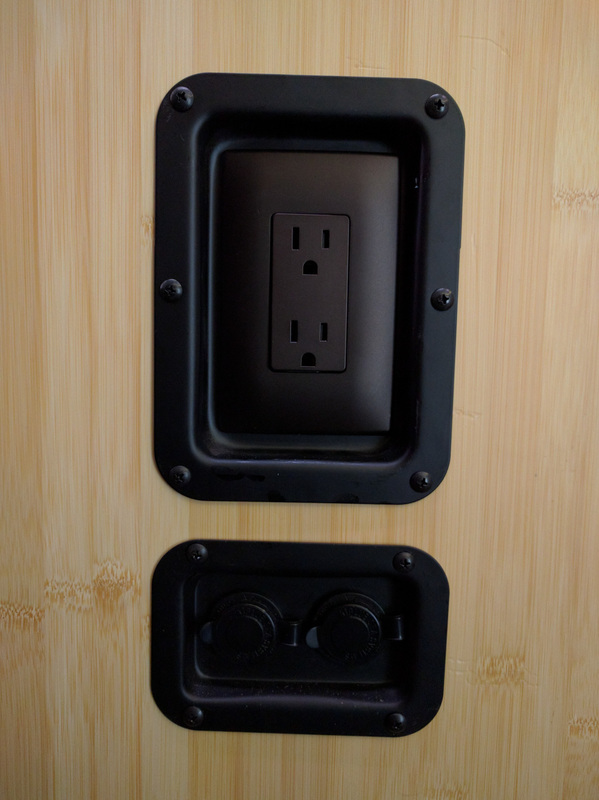 For the 12v outlets, we used one that has holes punched for two Neutrik connectors. We had to enlarge the holes slightly with a step bit. For some of the switches we used double jack plates. We also used plain blank plates for other components like the 110v outlets. That took a little more cutting! You’ll also want some 1/2″ Truss Head wood screws to complete the look. Edit: Shipping for these plates looks like a killer on the Amazon site, but if you are ordering several plates at once from the same third party seller the shipping costs only rise by a tiny bit for each additional plate. Hello! 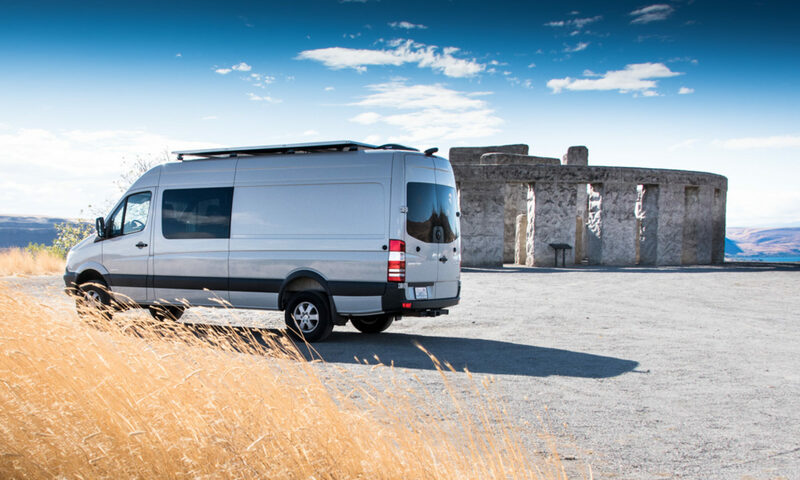 Do you remember how much yards of fabrics you used for your van? Thank you! Martin, we ordered 15 yards of fabric and it was just sufficient for the panels that we covered. Remember though that we didn’t cover the driver’s side lower wall or the sliding door panel. You’d need an extra couple of yards to cover those areas as well. Can you tell me where you sourced the flush mount recessed wall plates for your switches? Thanks for all the informative data you have on your site. Don, here’s a post on the wall plates . We ordered them through Amazon. Although the shipping looks hideous, if you order several at once it only increments by a couple of cents for each additional item. If you scroll up a little in the comments, I gave some more details about specific sizes to Christopher in September 2017. Thanks man. A minute after I sent I scrolled through your comments (again) and saw my answer. Love your site. I’ll make sure to order through your link.